Crafts is becoming history to be found in Museums. It is dying with Time and Culture remains only in Documents. Craftsmen have lost the strength to move ahead, so time has move on, leaving them behind. Machines have displaced Craftsmen and Culture has changed Trends. An effort through Workshop to save the Craft, Craftsmen and the Culture. Bamboo is a group of giant, perennial grasses, classified separately from trees. It is the largest and most productive member of the grass family. It is the fastest growing grass. Bamboo is a green gold and a very sustainable material on earth. It’s our duty to promote Bamboo to replace plastic, wood and metals to make the earth Green. The first day in the second phase of the summer workshop has started with the registrations of participants under the seven courses being offered in the campus. The participants were given a welcome kit to start their design thinking journey. Bamboo Summer Workshop has started with great excitement. 32 participants includes young school children, students, scientist, house wife’s, professionals and teachers from all over India. Participants were taken to the auditorium for the introduction session from our senior faculty Neelima Hasija where she talked about the various courses being introduced in these workshops, followed by a motivational talk for the enthusiasts by our Director Pradyumna Vyas. Mr. Vyas talked about how to see the positives in life always and try to solve the problems around with an optimistic approach. He also added, innovation is an idea of improvement in something. Head of furniture department at NID and the anchor for this workshop, Pravinsinh K. Solanki talked about the workshop, Bamboo as a future material. All the participants of the Bamboo workshop were taken to the furniture design studio after a tea break. They were amused to see the types of furniture being designed with a minimalistic approach using waste fabrics, cycle seat, bamboo and metal fan trash, etc. Pravin explained them that a design need not to be complex and expensive, it could be as simple as possible yet functional with great aesthetic value. 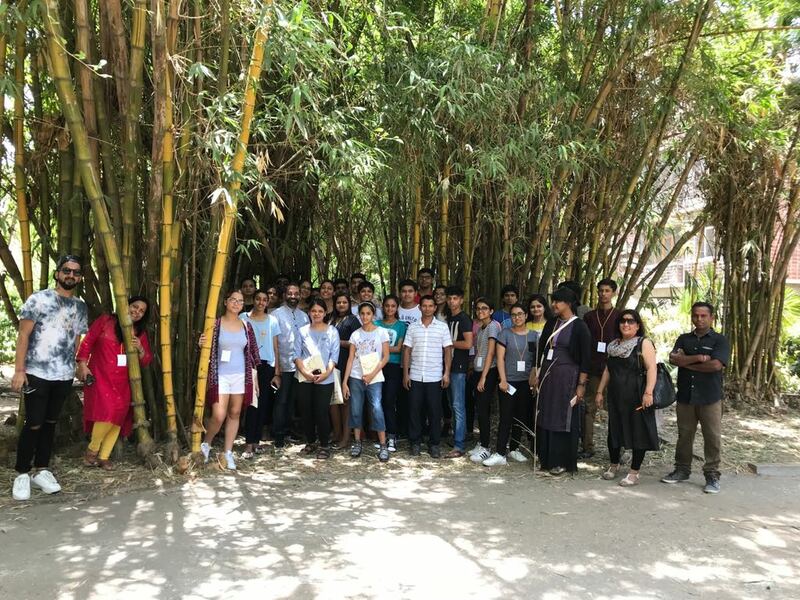 Participants were then taken to the International centre for Indian crafts @NID for a briefing about Bamboo as a grass, its properties and basics about working with Bamboo using tools. This was an introduction about What is Bamboo? Uses of Bamboo and everything about it to trigger the interest in the enthusiasts. They were then taken to the bamboo plantation at NID to experience the details and feel of bamboo. This visit was to expose them with the parts of bamboo, how it grows, types of bamboo and its properties before start working with the material. They really enjoyed the visit as they have seen bamboo this day with a design point of view for it to be the future material. – in detail about bamboo as a material, its futuristic scope, its uses, treatments, etc. – his journey to Nagaland and what all he saw over there in bamboo ranging from houses to utensils and what not. This session has widen up the participant’s exposure to bamboo products, what can be made with bamboo and its limitations. Further to support and polish the knowledge been shared so far, participants were introduced to the various types of tools and machines being used to create things with bamboo by Pavin, Subrata sarkar and Sudip Nid faculty. Participants were provided with the safely equipments and were free to get some basic hands on experience with bamboo after a demo by Subrata sarkar and Anil Bansal being the Master Craftsmen. Everyone got to feel the strength, accuracy and presence of mind needed to develop the skills for working with bamboo. And the first day of the workshop was fun and has ended with the knowledge sharing through presentations, talks, field visit, demos and hands on experience in the studio with a lot of excitement for the next day to arrive.